Hurricane Florence Forecast To Shift South [VIDEO] - Joe.My.God. Hurricane Florence is forecast to move slowly through the Carolinas and Southeast through this weekend and will cause catastrophic inland rainfall flooding, life-threatening storm surge and destructive winds. As of Wednesday morning, Florence was centered more than 500 miles southeast of Cape Fear, North Carolina, moving west-northwestward. Florence is being steered toward the coast of the Carolinas by a strong dome of high pressure aloft over the western Atlantic Ocean. However, the track forecast has now become less certain. That high-pressure dome aloft over the western Atlantic is now expected to weaken Thursday into Friday. 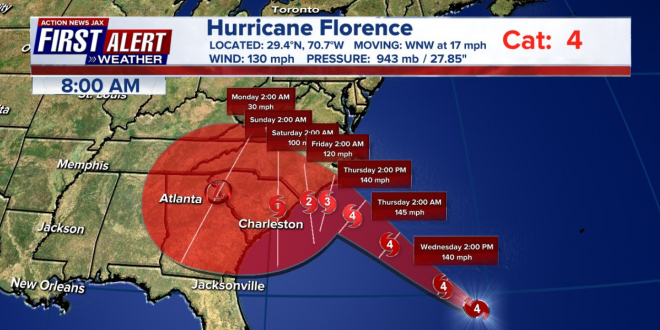 This will mean winds steering Florence will collapse for a time, slowing Florence’s forward speed to a crawl as its center near the coast from Thursday night into Friday. With low wind shear and warm ocean water, Florence could gain a little more strength through early Thursday. Flights to and from Charleston Wednesday continue to be canceled ahead of Hurricane Florence. Charleston Int’l Airport officials confirm they will shut down runways at midnight.